It isn’t just men who need to protect themselves from harm today. Some may even argue that women have a greater need to protect themselves with a concealed carry permit. If you’ve chosen the firearm and have been approved for your permit, then ladies – this guide is for you. 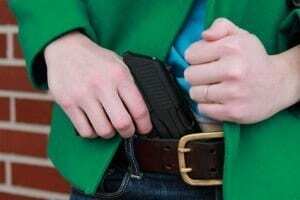 The best concealed carry weapon (CCW) holsters for women are sometimes inside the waistband, sometimes strapped to a convenient location, and sometimes located in your purse, clutch or handbag. Which is right for you? Let’s find out! Deciding what holster is right for you first depends on where you’ll be most comfortable carrying your firearm. Will a purse give you an easy enough draw should the need arise? Can an IWB holster work with your current outfit? The chart below contains the products that can begin to answer those questions for you. The first step to finding the best concealed carry holster is to determine which firearm you plan to own. If you haven’t chosen a firearm yet, then it’s difficult to shop for a holster. Many holsters for women are designed to carry one specific type of firearm and some are even brand-specific. In order to find the right holster, therefore, you must first find the right firearm. The next step is to determine where you’d like to carry the firearm. Women have numerous concealed carry options that are unavailable to men. From underneath the bra to inside a hidden pocket in your purse, the goal is to find the optimal level of safety and comfort as you go about your day. Because many concealed carry permits require a firearm to be completely hidden, you must find something that works with your body and your clothing without giving away the fact that you’re actually carrying a gun. Each holster option has some specific advantages and disadvantages to it, so a complete evaluation of these pros and cons must happen before you finalize your purchase. If you want to keep your firearm close to you, a belt carry or IWB carry holster is likely your best option. This allows you to grab your firearm quickly and securely if you’re facing an emergency situation. With this option, your clothing choices tend to be the greatest challenge to a successful carrying experience. Look for a holster that fits with your current choices – unless you’ve been looking for an excuse to buy a new wardrobe, that is. When a firearm is large and wide, it is more difficult to conceal. Heavy guns also tend to be more difficult to wield quickly. You’ll find that not every firearm you may own has a holster that successfully allows for an on the body concealment. This is where women have an advantage because purse holsters help you to keep your firearm close to you. Look for purses that only have a step or two necessary for you to access your firearm for the best results. If you have to unzip the front, unzip a pocket, and then unclip your firearm, you’ve lost precious seconds that you need. A unique option that has started to become available for women today is the camisole holster. The holster is built into the sides of this undergarment, about midway between the hip and the shoulder, allowing for an easy draw if you’re wearing a jacket over it. The best concealed carry holsters for women in this category will secure the firearm, but make it easy to release in just one motion. Unfortunately many of the holsters that are offered to women are a bit of a gimmick. You’ll find bold colors, animal prints, and other options that draw attention to the fact that you’re carrying a firearm. With a concealed carry permit, you’re not trying to advertise the fact that you’ve got a gun and aren’t afraid to use it. You’re keeping it there to deal with bad people who make bad choices that may involve you. Choose fit over fashion every single time. There are beautiful leather holsters with detailing that will still appeal to the eye, yet won’t make people stop and stare at you because they see you’re carrying a firearm. Considering how different women can be with their curves, think comfort before style and you’ll have a successful carrying experience. That’s not to say that fashion should be completely ignored. The challenge here is that many holsters that you’ll find, even when marketed to women, are designed to fit a man’s body. Women need more versatility, but they also need a holster that can work with their variety of outfits for a proper concealed carry experience. Check fit first. Check the security of the firearm second. Then check for fashionable options that work with your lifestyle and you’ll be able to find the best concealed carry holster. What Are the Prices of Concealed Carry Holsters for Women? Pricing in this category depends on what type of holster we’re talking about. IWB holsters tend to be around $30 and are sometimes less. Compression garments, either uppers or lowers, tend to be priced in the $20-$50 range. If you’re looking for a concealed carry purse, an entry-level price is about $70 right now. Pocket holsters can sometimes be found for less than $20. Remember to double-check that your preferred firearm will work with your preferred holster. It is not unusual, even for a purse holster, for precision molding to be in place for nylon and kydex holsters. This way you won’t be stuck trying to return a holster that doesn’t hold your firearm as you expected. This purse holster is one of the best concealed carry ideas for women that we’ve seen in a long time. It allows you to convert any existing purse into a concealed carry handbag in just minutes. It fits any handbag that is 10-16 inches in length and allows virtually any firearm to be securely carried. You can also use your existing holster with this platform through the belt loops for an effective on the person carrying experience. It’s flat, sleek, and effective. Give this holster a try and we think you’ll be as pleased as we were. The problem with many belly band holsters for women is that they are only designed for certain body types. That isn’t a problem with this holster as it’s available in four sizes and has adjustable features so that every woman can arm themselves as they deem appropriate. Unlike other holsters, you can actually carry two firearms, from small-to-large frame automatics to a medium revolver. It fits either hand, is made in the USA, and is comfortable enough to wear all day. The only issue we saw was some sweat development underneath the band with all-day wear. This is the perfect pocket holster for women who want to slip their firearm into their purse or into a jacket pocket as they head out the door. The unique design helps to reduce the outline of the gun while still protecting the trigger from an accidental discharge. It features a grip-up position with its open top design and most gun models will fit into this holster. It’s nothing fancy, but it gets the job done and is a highly affordable holster – and sometimes that’s really all you need to have. If you’ve tried shoulder holsters unsuccessfully in the past, then ladies – here’s the perfect solution for you. This concealment tank top looks great underneath a coat, yet still gives you the perfect angle for a draw should you need to defend yourself. The form-fitting polyester design is comfortable and the gun positioning isn’t right in your armpit to make you uncomfortable. It works best with sub-compact firearms, keeps your gun secure through most activities, and there is a holster on both sides so you can carry on your preferred side or carry two if you prefer. This universal clip is designed to work with your preferred placement, no matter where it might be. It works best as an IWB or OWB holster, but can even be placed in your purse. Made from leather, the barrel of the firearm is allowed to remain exposed as you carry. The retention isn’t the best with this holster, but considering the price point it’s still pretty good. It’s designed more to carry a large framed gun, so keep that in mind if you have a smaller gun that you want to holster. The best concealed carry holsters for women will work with your fashion and lifestyle choices. Whether it’s in your purse or underneath your jacket, there are many innovative ways for you to utilize your concealed carry permit today. Your choice is simple: what holster best meets your needs? With these reviews, you’ll be able to answer that question right away. Best IWB Holster ReviewsWhat Is the Best Gun Cleaner?